Good fortune deserves to be celebrated over and over again. And you’ll have lots of chances to do so at Slots of Vegas when you play God of Wealth, an amazing online slots game with 25 paylines and loads of winning opportunities. The God of Wealth is dedicated to making sure your year is a special one. And he starts by giving you free games just by hitting three special Gold Ingots. The showers of wealth continue with a big progressive jackpot, rewarding symbols, and a top award of 10,000x your bet per line. Ready to play? All you need is a Slots of Vegas account and the desire to win, so come join us! It’s easy to summon the God of Wealth. Start by placing your bet. To do so, you must choose your bet amount and your line amount. Your bet amount can range from $0.01 to $5 per line and your line amount can go as high as 25 lines. Your bet per spin is determined by multiplying the two figures together. It’s only locked in once you hit the Spin button. As soon as you do, the reels will spin really fast and come to a stop just as quickly. You’ll then get paid out based on how many symbols you’ve managed to line up on a winning payline. Hit three or more scattered Gold Ingots and you’ll win a bunch of free spins where you’ll bet on the house’s dime. If you want the God of Wealth to smile down on you, be sure to play all 25 paylines. If you’re short on bankroll, it’s a better call to reduce your bet per line while leaving your lines in play set to the max. This way, if a symbol lines up on a potential payline, you won’t miss out on winning big. You can reduce your bet per by using the up and down arrows next to the Bet button. And you can keep your paylines set to the max by ensuring that the Lines value is set to 25. 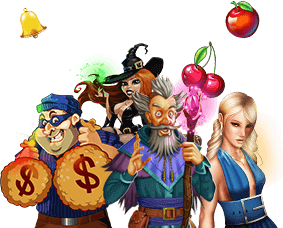 Substitute Symbol: The God of Wealth symbol subs in for almost every other symbol in this online slots game. The only exception is the scatter symbol. Scatter Symbol: In God of Wealth, the Gold Ingot is the scatter symbol. Hit three of them and you’ll get to play a whole bunch of free games, on the house. Autoplay: If you want to play faster and win faster, turn on Autoplay. We’ll spin for you, pay you out automatically, and spin for your again using your last chosen bet and line selections. And we’ll keep going until you tell us to stop.